Beautiful valley setting North of Bozeman with amazing views of the Bridger Mountains. Great fishing out the back door on the East Gallatin River. Five bedrooms and three full baths. The home has wireless Internet. Brief Description: This spacious five bedroom home is located just ten minutes from downtown Bozeman and ten minutes from the airport! With gorgeous mountain views and a river in the back yard, what more could you ask for? Bedrooms and baths: This home has five bedrooms and three full bathrooms. On the main level of the home is the master bedroom with king size bed and private bath. There is one more bedroom on this level with a queen size bed and its own full bath out in the hall. Upstairs are three more bedrooms, two of these bedrooms have queen size beds and the third bedroom is set up with two twin beds. The three upstairs bedrooms share a full bathroom, with tub and shower at the end of the hall. Kitchen: This fully equipped kitchen has everything you will need to cook up some good meals for all your guests. In additional to all the cookware and serving ware you will need, there is tons of space to spread out if you are really cooking up a feast. You will also find a good spice cabinet and a gas grill outside for barbecues. Dining area: There is a breakfast area off to the side of the kitchen that seats four, plus the dining room table which seats ten comfortably. Built in cabinets for dishes and a pass through between the kitchen and dining area make entertaining a breeze. Living room: The home has two living areas for your group to spread out. Downstairs is the main living area with some great seating areas to hang out, relax and talk about your days' adventures. Upstairs is a second family area that is set up as the "TV room" with cable TV or just another area to play games, read a book, etc. Setting, acreage, views: River's Bend Retreat is located on an amazing three acre property just ten minutes North of Bozeman. With the river winding its way through the back yard, there is an amazing 500 feet of river frontage! Unobstructed views of the Bridger Mountains from the back deck is nearly all you see. Activities nearby: Besides fishing before breakfast, there is horseback riding, rafting, golf, tours of Yellowstone National Park and everything that the towns of Bozeman, Belgrade, Big Sky and Livingston have to offer. For an especially memorable experience in the park, book a specialized private tour with our sister company, Greater Yellowstone Guides. Closest town and airport: It's about a ten minute drive to the Gallatin Field airport or to downtown Bozeman. Belgrade, which has quite a few restaurants and a couple good grocery stores, is also ten minutes from the home. Livingston is 30 minutes away and Big Sky is one hour from the home. Beautiful valley setting North of Bozeman with amazing views of the Bridger Mountains. Great fishing out the back door on the East Gallatin River. Five bedrooms and three full baths. The home has wireless Internet. Brief Description: This spacious five bedroom home is located just ten minutes from downtown Bozeman and ten minutes from the airport! With gorgeous mountain views and a river in the back yard, what more could you ask for? Bedrooms and baths: This home has five bedrooms and three full bathrooms. On the main level of the home is the master bedroom with king size bed and private bath. There is one more bedroom on this level with a queen size bed and its own full bath out in the hall. Upstairs are three more bedrooms, two of these bedrooms have queen size beds and the third bedroom is set up with two twin beds. The three upstairs bedrooms share a full bathroom, with tub and shower at the end of the hall. Kitchen: This fully equipped kitchen has everything you will need to cook up some good meals for all your guests. In additional to all the cookware and serving ware you will need, there is tons of space to spread out if you are really cooking up a feast. You will also find a good spice cabinet and a gas grill outside for barbecues. Dining area: There is a breakfast area off to the side of the kitchen that seats four, plus the dining room table which seats ten comfortably. Built in cabinets for dishes and a pass through between the kitchen and dining area make entertaining a breeze. Living room: The home has two living areas for your group to spread out. Downstairs is the main living area with some great seating areas to hang out, relax and talk about your days' adventures. Upstairs is a second family area that is set up as the "TV room" with cable TV or just another area to play games, read a book, etc. 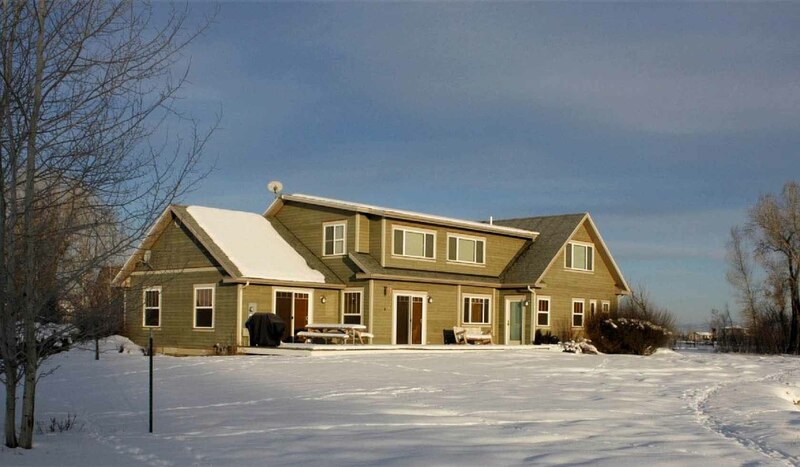 Setting, acreage, views: River's Bend Retreat is located on an amazing three acre property just ten minutes North of Bozeman. With the river winding its way through the back yard, there is an amazing 500 feet of river frontage! Unobstructed views of the Bridger Mountains from the back deck is nearly all you see. Activities nearby: Besides fishing before breakfast, there is horseback riding, rafting, golf, tours of Yellowstone National Park and everything that the towns of Bozeman, Belgrade, Big Sky and Livingston have to offer. For an especially memorable experience in the park, book a specialized private tour with our sister company, Greater Yellowstone Guides. Closest town and airport: It's about a ten minute drive to the Gallatin Field airport or to downtown Bozeman. Belgrade, which has quite a few restaurants and a couple good grocery stores, is also ten minutes from the home. Livingston is 30 minutes away and Big Sky is one hour from the home.